The gall of those galls teaching me something new! Pink oak leaf gall, October 2016. Photo by Mary Warner. See that pink fuzzy critter in the middle of this dried oak leaf? I thought it was some form of caterpillar cocoon. Some, nice cozy home out of which a butterfly or moth would hatch, with the fuzzy form being suitably appropriate to our Minnesota winters. Ha! I was close, but no cigar. So, there could be insects inside the gall, but maybe not. I’ve seen galls before on our oak leaves, but was never curious enough to look them up until now. Perhaps it was the preponderance of them this year that nudged me into the research. Galls can take different forms depending on what plant they grow on and what insect forms them. Have you seen galls other than the fuzzy ones in my pictures? 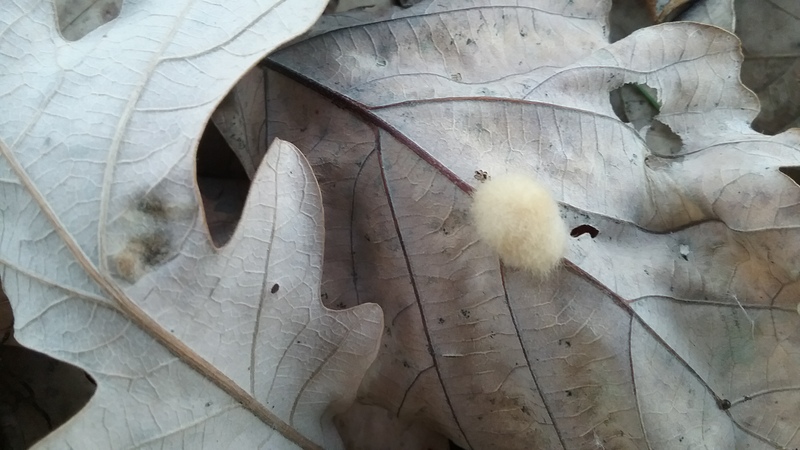 Cream-colored gall on oak leaf, October 2016. Photo by Mary Warner. Galls on oak leaves, October 2016. Photo by Mary Warner.